Establishment of SEZs and government infrastructure projects such as metro rails, smart cities, expansion of state & national highways and rising power demand are fueling the market for diesel gensets in Thailand. Increasing telecom infrastructure, rising residential societies and expansion of business parks would further boost Thailand's diesel genset market. According to 6Wresearch, Thailand diesel genset market is projected to touch $81.6 million by 2022. In Thailand, diesel gensets with rating less than 750 KVA accounted for majority of the market share due to reasonable cost and wide range usage of across various applications. The regional share of diesel genset market is dominated by three main regions of Thailand namely Central, South and West region as most of the industry and major tourist destinations are situated over these regions. Central region leads the power backup requirement as the region is home of capital city Bangkok which is a major hub for tourists, industries and manufacturing sector. The report thoroughly covers Thailand Diesel Genset market by KVA ratings, verticals and regions. The report provides the unbiased and detailed analysis of the on-going trends, opportunities / high growth areas, market drivers which would help the stakeholders to device and align their market strategies according to the current and future market dynamics. • Historical Data of Global Diesel Genset Market Revenues and Volume for the Period 2010-2015. •	Historical Data of Thailand Diesel Genset Market Revenues and Volume for the Period 2010-2015. •	Market Size & Forecast of Thailand Diesel Genset Market Revenues and Volume until 2022. •	Historical Data of Thailand Diesel Genset Market Revenues by KVA Rating for the Period 2010-2015. •	Market Size & Forecast of Thailand Diesel Genset Market Revenues by KVA Rating until 2022. •	Historical Data of Thailand Diesel Genset Market Volume by KVA Rating for the Period 2010-2015. •	Market Size & Forecast of Thailand Diesel Genset Market Volume by KVA Rating until 2022. •	Historical Data of Thailand Diesel Genset Market Revenues by Verticals for the Period 2010-2015. •	Market Size & Forecast of Thailand Diesel Genset Market Revenues by Verticals until 2022. •	Historical Data of Thailand Diesel Genset Market Revenues by KVA Ratings by Verticals for the Period 2010-2015. •	Market Size & Forecast of Thailand Diesel Genset Market Revenues by KVA Ratings by Verticals until 2022. •	Historical Data of Thailand Diesel Genset Market Revenues by Regions for the Period 2010-2015. 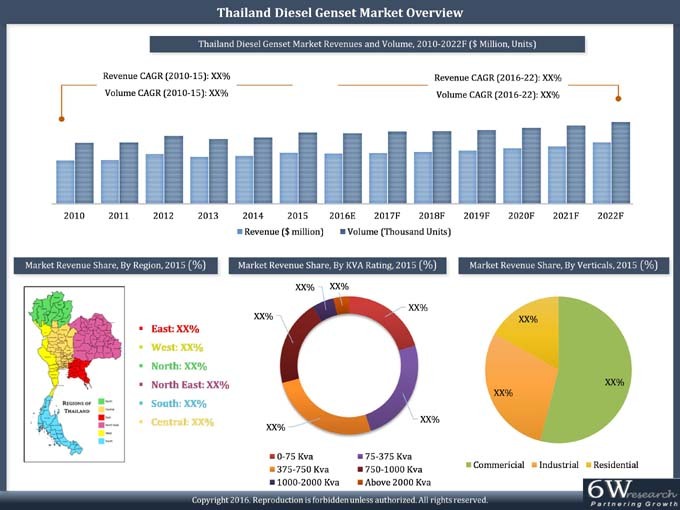 •	Market Size & Forecast of Thailand Diesel Genset Market Revenues by Regions until 2022. 18.9 Himoinsa Power Systems, Inc.
Thailand is emerging as one of the key growing gensets market in the Asia-Pacific region. Owing to the establishment of SEZs, rising power demand as well as increasing government infrastructure projects such as metro rails, smart cities, and expansion of state & national highways. These factors would fuel the market for diesel gensets in Thailand. Additionally, increasing telecom infrastructure, rising residential societies and expansion of business parks would further boost the demand for diesel gensets in the country. The major companies in Thailand diesel genset market include- Cummins, Caterpillar, Scania, Himoinsa, Denyo, Kipor power and Lega power.